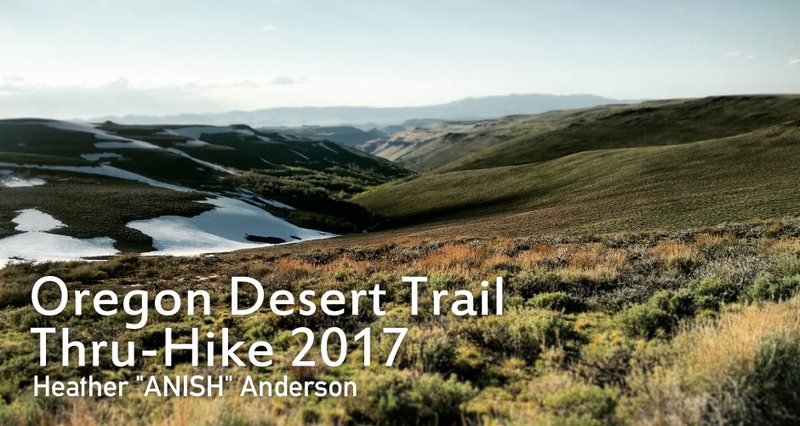 The Oregon Desert Trail is a conceptual route created in 2011 by the Oregon Natural Desert Association. 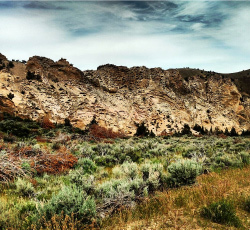 It connects some of the most spectacular scenery Oregon has to offer including the Hart Mountain National Antelope Refuge, the Steens Mountains, the Pueblo Mountains, and the Owyhee Canyonlands. The Western Terminus is in the Oregon Badlands Wilderness and the Eastern Terminus is in the Lake Owyhee State Park near Ontario, Oregon on the Idaho border. Since the Oregon Desert Trail is a route, there is very little “trail on the ground,” no ODT markings, and much of it follows old jeep roads or is cross-country. 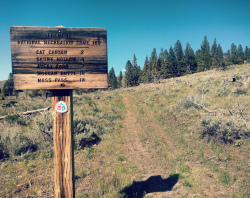 Users are encouraged to make their own route choices through public lands, following the GPS track and waypoints developed and provided by the Oregon Natural Desert Association. You can read more about the ODT as well as many Eastern Oregon natural features at onda.org. This route wasn’t as physically demanding as it was mentally demanding. Because there was little marked trail and a lot of cross country navigation was nearly constant. Because there are extensive dry sections one must also be aware of water sources and availability. I carried up to 2 gallons of water. I used a combination of a GPS, the ONDA maps, Oregon Desert Trail Guide, Oregon Trail Town Guide, and the databook. The Oregon Desert Trail passes through directly through or within one mile of 6 communities: Paisley, Plush, Frenchglen, Fields, Denio, and Rome. I also chose an alternate through the community of Christmas Valley. This provides an opportunity for hikers to resupply regularly by purchasing food from small stores in some of the locations, and also by sending boxes to others. This combined with my high mileage enabled me to keep most of my food carries to under 4 days. This allowed me to utilize my generous sponsorships from TrailButter, Salazon Chocolate, Nuun, and Greenbelly Bars. The mascot animal of the Oregon Desert Trail is the antelope. I saw dozens of them along the route. There were also bighorn sheep, a variety of snakes, lizards, birds, and range cattle. The first 3 days were typical spring weather in the desert with a mix of sun, sleet, snow, and rain. The route passed through a variety of terrain: badlands, Pine Mountain, lava fields, forest and range. I chose to route an alternate to walk directly through Christmas Valley in order to resupply and break up a 95 mile waterless stretch. This enabled me to avoid caching water prior to my hike and carry less food from the start. However, this added many miles of paved highway walking to the route. There were many cattle in the BLM managed valley below Diablo Rim. For whatever reason they decided to run away from me, repeatedly, resulting in my inadvertent herding of them for over 10 miles! Paisley is a small community perched on the cusp of the Fremonts. 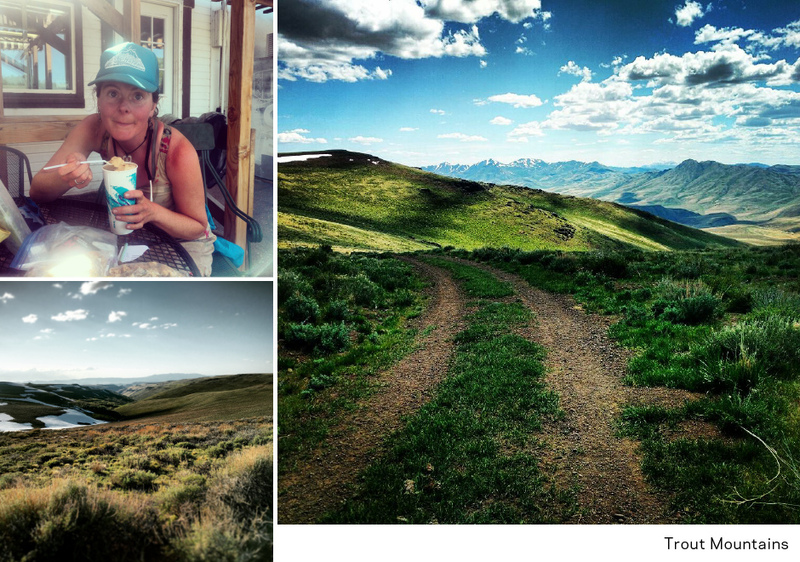 It was a pleasant place to eat, refill water, and get ready to hit the first extensive trail section of the route. Region 2 began with a 7 mile roadwalk up to the Fremont National Recreation Trail. The temperatures were pleasant and it was glorious to hike up above the desert and into the alpine. The snow was just melting out and I had to cross a few lingering patches. The views were extensive. Near the eastern section of the Fremonts I encountered too much snow to make travel reasonable, so I bushwhacked to a contouring road which I followed to the Abert Rim. Abert Rim was one of the highlights of the trail since it is one of the longest fault escarpments in the US. Although it was rocky and mosquito laden, it had incredible views and was fascinating geologically. That night I camped in the Colville Timbers which is a lonesome stand of pines perched near the rim. The next day was a long, hot, mostly road walk down into the town of Plush. There I collected my box, ate a lot of ice cream, and was even able to take a shower due to the kindness of one of the people who lived there. Once evening fell I walked out of town, again on pavement, around Hart Lake. It was pleasant to walk into the night in the coolness, listening to birds and watching the sunset. I camped beneath a spreading cottonwood tree and was awakened by the sound of water birds shortly after dawn. The first spring was dry, but the second one near an abandoned homestead was a tiny drip. It took a very long time to fill my bottles. It was very hot by the time I began ascending to the upper plateau which comprised the Hart Mountain Antelope Refuge. The refuge was surprisingly soggy due to the recent melt. The route was supposed to follow primitive roads, but these have completely vanished meaning many miles of slogging cross country through flooded meadows and sage. 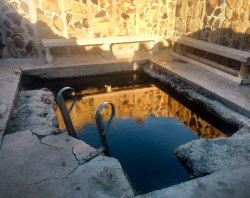 The promise of a developed hot spring waiting at the end kept me going. As it was I arrived at the hot spring campground just before dark and had a hard time finding it. I was also starving from a 32 mile day, so I only spent 15 minutes in the water before finding home for the night. The next day I decided to follow the graded dirt road 49 miles to Frenchglen. My shoes were a half size too small and had plagued me with excessive blisters since the first day. This combined with the remaining peroneal tendinitis from a race in April had me hobbling. Taking the direct road toward the next town was flat and boring, but it seemed to be the best choice given my condition and the fact that I had new shoes waiting for me there. I arrived in Frenchglen the next afternoon in time to get my box and eat some food before trying to head up into the Steens. One of the difficulties of completing the Oregon Desert Trail is hitting the right weather window for each of the unique areas. The Steens represent one of the biggest challenges since they don’t typically melt out until July and this year was an especially high snow year. I opted to take the closed road to the summit rather than the dangerously flooded Big Indian Canyon. About 6 miles up I was suprised to encounter a juniper removal/restoration crew. They informed me that there was approximately 10-12 miles of snow to cross to reach the summit. Without an ice ax and with very tender feet, I decided to accept a ride back to Frenchglen and hitch from there back to the graded dirt road I had walked from the Hart Mountain Antelope refuge to walk around. This meant 45 miles of paved highway. IT was hard on the feet, but easier than sliding around in wet shoes. In the two days it took to walk to Fields my feet healed noticeably. Fields was a chaotic location to eat and enjoy a much needed milkshake after dodging cattle and walking so many road miles. From there I headed up into the Pueblo Mountains. These were a delightful surprise. This mountain range is tucked along the Oregon/Nevada border and travel was nearly entirely cross country. Bighorn sheep abounded. The descent to Denio Canyon was some of the thickest bushwhacking I have ever done in a narrow canyon with water rushing through. The canyons winding from Denio up into the Trout Mountains where deserted, but gorgeous. The Trout Mountains were comprised of an immense plateau above 8,000 ft. The snow had recently melted leaving flowers peeking out. I departed the regular route to descend an alternate canyon and follow cow paths to a dirt road leading to McDemitt, NV for the next resupply. The route from McDermitt to the end of the trail passes through the exceedingly remote Owyhee Canyonlands. This section provided many challenges to me personally since it was a very high water spring. Several fords required swimming, which is not my strong suite. However, I thankfully had a partner who was a strong swimmer that helped me with the crossings. One evening there was an incredibly powerful thunderstorm which I was happy to escape by fleeing down to the river to a goreous riverside campsite. A couple of days later the route led to the shore of the Owyhee Reservoir. I was dismayed to discover that the lake levels were so high that several dikes were impassible. The traversing along the shoreline above the water also seemed too steep to pass. I had no choice but to turn around and backtrack. The extra miles and wasted time was demoralizing, but at least it had a serendipitous ending by taking me through Dago Canyon which was a gorgeous canyon full of honeycomb rock. The final day on the trail was a labyrinth of canyons with soaring walls, honeycomb rock, scrambling over pour-offs, and extreme heat. I was thankful that the hike was ending as summer seemed to be imminent. GPS was essential for navigation. I couldn’t help but think of the petroglyphs that must be scattered throughout. I knew I must come back and explore more. Once again I marveled at the fact that I had still not seen another hiker on the entire route! I hiked until midnight and was awake at 4am in order to cover the miles to the finish in time to meet my pre-arranged ride. I listened to coyotes...and a few howls that sounded more like wolves(!). As I descended toward the finish I saw something that seemed like one last challenge of the ODT: the finish had become an island rather than a peninsula due to high lake levels. One last swim...to the finish! 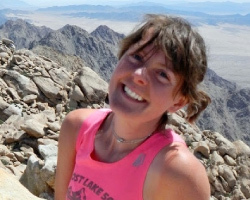 Heather, known as Anish on trails, is a Triple Crown thru-hiker, ultra-marathon runner, mountaineer, and lover of all things wild and mountainous. 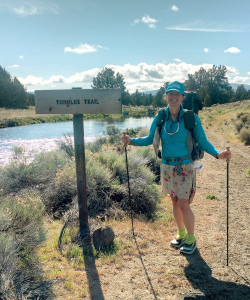 She is well known for setting the overall self-supported Fastest Known Time (FKT) speed record on the Pacific Crest Trail in 2013 (60 days, 17 hours, 12 min), breaking the previous men's record by four days and establishing the first female record. In 2015 she once again made FKT history, setting the overall self-supported FKT on the Appalachian Trail (54 days, 7 hours, 48 minutes) also breaking the men's record by four days and the female record by 26 days. My go to insulating layer this jacket was perfect for cool mornings and evenings. I wore it nearly every day. Windblocking, insulating, and warm even when sweaty this jacket went far beyond expectations. This jacket is an excellent ultralight rain jacket for all seasons. It was comfortable and surprisingly breathable unlike almost every UL rain jacket I’ve tried. It was essential during the initial foul weather period. A reliable windshirt is an essential piece of gear for me. At only 3.6 oz this piece doesn’t weigh much or take up too much space. The zippered pockets were perfect for keeping gloves and/or maps handy. Layered with the U.L. Thermawrap Jacket it was the perfect set-up on the high plateaus of the ODT. Waterproof. Breathable. Comfortable. Full Range of Motion. Easy on and off over footwear. These factors set these rain pants apart from others I’ve tried. They kept me warm and dry during the several days of spring storms (hail, snow, sleet, rain). They were also effective against bugs. Despite it weighing nearly 3lbs it was well worth the weight to take my zero degree bag. Despite daytime highs in the 80’s the nights were frequently at or below freezing. My summer bag would not have been adequate, but the Down Hugger kept me cozy.